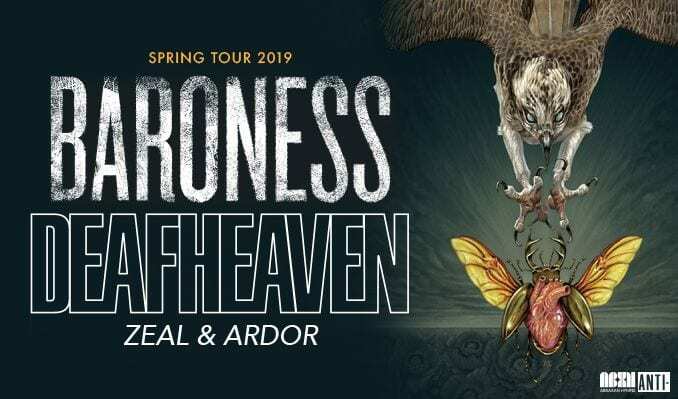 Metal bands Baroness and Deafhaven have revealed a co-headlining tour set to kick-off early next year. The outing will begin in Houston, Texas on March 3, 2019, and Zeal & Ardor will open the show on all dates. They’ll make stops in cities like Seattle, Denver, Chicago, Toronto, Cleveland, and New York City before closing out the run late April in New York City. Deafhaven and Baroness are also set to perform at the Decibel Metal & Beer Fest in Philadelphia, Pennsylvania on April 14. Zeal & Ardor also dropped an album this year – the sophomore LP, Stranger Fruit, includes singles “You Ain’t Coming Back,” “Built On Ashes,” “Waste,” and “Gravedigger’s Chant.” On the other hand, Baroness is currently working on their fifth studio album, which will follow 2015’s Purple.